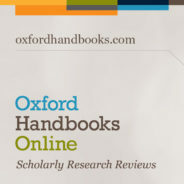 Oxford Handbooks Online (OHO), the home of scholarly research reviews, is an outstanding collection of the best Handbooks in 14 subject areas and growing. The collection of Oxford Handbooks is one of the most prestigious and successful strands of Oxford's scholarly publishing, containing in-depth, high-level articles by scholars at the top of their field. On 8 May 1788, Edward Gibbon celebrated the publication of the final three volumes of his History of the Decline and Fall of the Roman Empire at a dinner given by his publisher Thomas Cadell. Gibbon (born 27 April 1737) was just 51; he had completed perhaps the greatest work of history ever written by an Englishman, and certainly the greatest history of what his contemporary David Hume called the “historical age,” and we think of as the Enlightenment. What made Gibbon’s Decline and Fall an Enlightenment history? One obvious answer is its apparent hostility towards religion, Christianity in particular. That hostility was manifest above all in the notorious chapters 15 and 16 with which Gibbon ended the first volume, published in 1776. In these, Gibbon treated, first, “the progress of the Christian religion” between the death of Jesus and the ascent of Constantine to the Empire, and then the persecutions to which Christians had been subject since the reign of Nero. Gibbon gave offence from the very beginning of chapter 15, by ostentatiously setting aside any explanation for the rise of Christianity as the work of divine providence, and focusing instead on five “secondary causes,” including the “intolerant zeal” of the Christians (a zeal they inherited from the Jews), their beliefs in the immortal soul and in miracles, their pretension to purity of morals, and their discipline, which quickly made the Church an independent state within the Empire. Worse still were Gibbon’s footnotes—a relatively recent scholarly and printing innovation, which Gibbon effectively weaponised. The irony may seem gentle—as in St Augustine’s “gradual progress from reason to faith” (ch. 15, n. 37)—but it also kicks, as in the later observation that Augustine’s “learning is too often borrowed, and his arguments are too often his own” (ch 28, n. 79). To Gibbon’s clerical contemporaries (some of them his friends), this, and much else, was no better than a sneer. But was it as simple as that? We know that Gibbon himself was taken aback by the clerical response. He issued a famous Vindication (1779) of his scholarship, but in re-issues of volume I, he also muted his sneers. Modern Gibbon scholars, notably John Pocock, David Womersley, and Brian Young, believe that we should take another look at his treatment of religion. For Gibbon had an abundance of the historian’s greatest attribute—curiosity. That too is evident in his decision to write chapters 15 and 16. Before he tackled the conversion of Constantine and the adoption of Christianity as an Imperial religion, he needed to explain why Christianity had grown strong enough to attract Constantine’s allegiance, and why the Christians had so wilfully refused the toleration extended to them by Roman paganism. But it was once the Church had established itself that Gibbon faced his major challenge. 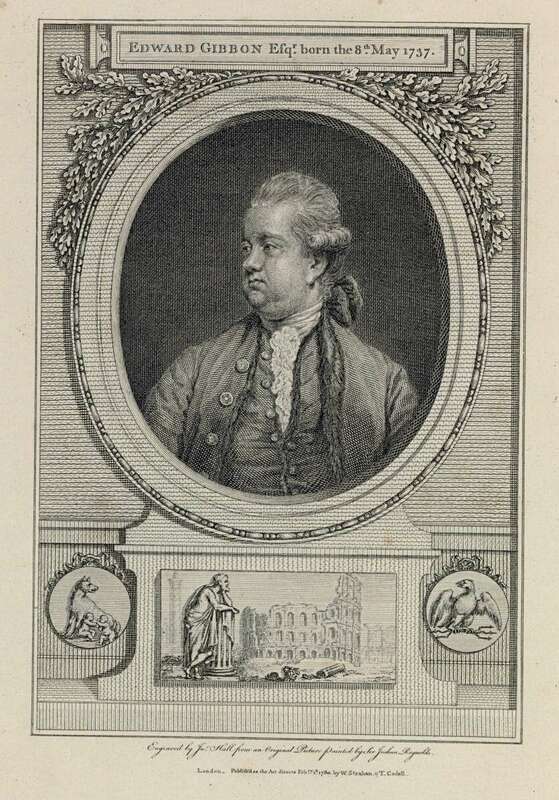 Portrait of Edward Gibbon (1737–1794): The History of the Decline and Fall of the Roman Empire. Public Domain via Wikimedia Commons. For he now engaged with ecclesiastical history as a form of “sacred history.” To its adherents, the Church was the “body of Christ” and heir to Christ’s mission; to write its history, the task undertaken by Eusebius in his History of the Church (c.300–325), was to perpetuate the truth claims of that mission. Gibbon may have been indifferent to those truth claims, but he realised that there could be no history of the Christian Church which did not do justice to its theology, and the fierce disputes which accompanied the establishment of “orthodoxy”. Read with one eye chapter 21, in which Gibbon recounted the great controversy over the Trinity, or chapter 48, in which he did the same for the Incarnation, may appear master-classes in keeping a skeptical, disbelieving distance. But read with both eyes, they reveal Gibbon’s effort to understand Christianity as its adherents did. If Gibbon were only a critic who had not made the effort to understand the history of the Church from within, he could never have explained not merely the “triumph” of Christianity, but the extent to which it went on to sustain the Empire it had come to subvert, and to facilitate the transmission of the culture of the ancient world to the modern. Even so, Gibbon’s most remarkable exercise of historical curiosity was still to come. When he turned in volumes 4–6, to consider the fate of the Byzantine Empire, he realised that “the triumph of barbarism and religion” over the Roman Empire had been as much the achievement of Islam as of Christianity. Gibbon took up the challenge of understanding Islam, and its even more rapid rise, in Volume 5, chapters 50–52. To do so, he had to overcome unaccustomed obstacles, not least that he did not know Arabic: he was therefore reliant on Christian scholarship in Latin and modern European languages, much of it hostile to its subject. But as his footnotes show, he was on the alert for bias, while drawing on the observations of curious travellers to depict the context in which Muhammad (“Mahomet”) had successfully gathered support for his message. The role of Mecca and Medina as rival cities, strategically placed for trans-desert commerce, along with the martial culture and tactical flexibility of the pastoralist “Bedoweens,” helped him to explain the Prophet’s initial survival and eventual triumph. But here too Gibbon recognised the need to understand the content of the new religion, the extent to which it was a response to both Judaism (from whose Patriarch, Abraham, the Arabs too were descended, through his first-born, Ismael), and an increasingly sectarian Christianity. Amidst their ever more convoluted disputes, the appeal of Muhammad’s simple, “unitarian” idea of God was clear. But if Islam was a religion of enthusiasts, it was also strikingly tolerant by comparison with Christianity: “the passages of the Koran in behalf of toleration—Gibbon noted—are strong and numerous” (ch. 50, n. 114). History as Gibbon wrote it in the Decline and Fall was thus far from a simple exercise in the subversion of religion. At the least, curiosity was combined with scepticism, and translated into a willingness to engage with the “sacred”. Gibbon was not, of course, every Enlightenment historian. He stands out even from his greatest contemporaries, Voltaire, David Hume, and William Robertson, in his curiosity as well as in his scholarship and his style. But he is representative of the Enlightenment’s commitment to understanding as well as to criticism, and not least to understanding the power of religion. Featured image credit: The Emblem of Christ Appearing to Constantine / Constantine’s conversion Peter Paul Rubens, 1622. Philadelphia Museum of Art. Public Domain via Wikimedia Commons. John Robertson is Professor of the History of Political Thought at the University of Cambridge. He is the author of The Enlightenment. A Very Short Introduction and of "Europe's Enlightenment" in The Oxford Handbook of Early Modern European History, 1350–1750: Volume II: Cultures and Power, edited by Hamish Scott.